Why should you choose Labouré’s RN-BSN? → Affordable: At $300/credit, it is the lowest priced accredited online program in Massachusetts. → Flexible: Now 100% online to accommodate working nurses. Choose from a variety of start dates throughout the year. → Accelerated: With 7-week courses, you can finish your degree in 16 months. Completed coursework in the past? Get credit for your work by transferring up to 90 credits from other institutions. 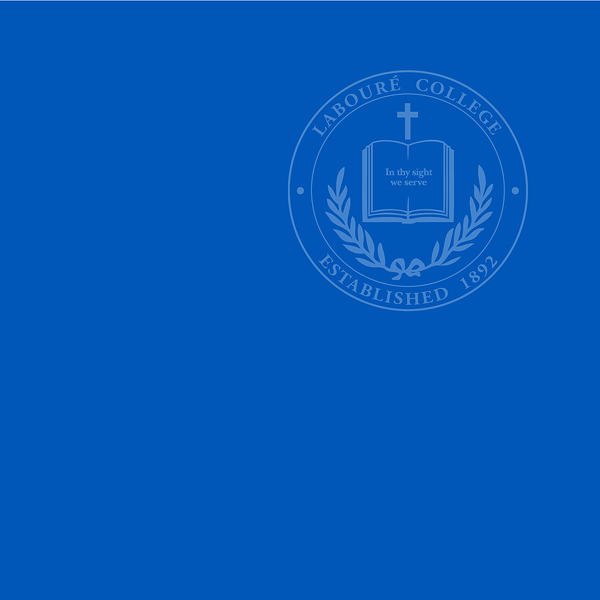 The baccalaureate degree program in nursing at Labouré College is accredited by the Commission on Collegiate Nursing Education (http://www.ccneaccreditation.org). The pace of the program is up to you. Each semester is broken into two 7-week segments: Session I and Session II. Students with no transfer credits can complete the program in 4 semesters by registering for two courses each 7-week segment. Students with transfer credits may graduate sooner than 4 semesters.  Labouré College is accredited by the New England Commission of Higher Education (formerly the Commission on Institutions of Higher Education of the New England Association of Schools and Colleges, Inc.). Students may transfer up to 90 credits, including 18 of the 21 BSN general education credits. There is no time limit or expiration date for transfer courses - including science courses. Students are required to complete the Capstone course at Labouré. Students also must complete a three-credit course in Ethics and one in Statistics—either at Labouré OR at another accredited institution. Transfer credit will be awarded for courses that meet the criteria of a baccalaureate program. All courses awarded transfer credit must have a grade of C, or higher. 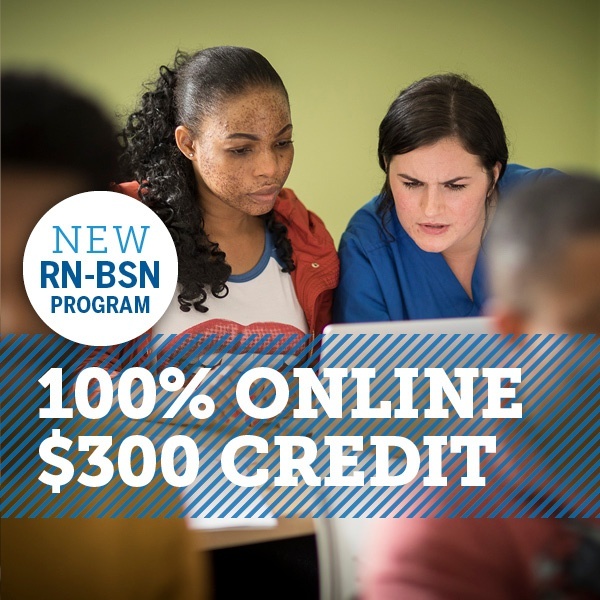 The residency requirement for BSN students is 30 credits. Check out our Transfer Credit Policy or contact Admissions for more details. "Don’t waste time and energy debating whether or not you need more education. Just go after it, if you haven’t already. The healthcare environment is more complex than ever, and the job market is more competitive. All nurses need to have a broader knowledge and skill set, beyond the clinical, to succeed and work at their highest potential." American Nurse Today, "Ten Tips to Reboot Your Nursing Career"
Many hospitals now require the BSN as a minimum credential for newly hired nurses. "A nurse with an ADN can do many indispensable day-to-day tasks, including most of the duties the public thinks of when it thinks of nurses. They can talk to the patients and jot down their symptoms, take vital signs, coach surgery patients on what to do after their operations, and teach any and all patients how to manage their illnesses and injuries better. Many hospitals, nevertheless, need more. Their nurses will face bigger and more challenging caseloads than their ADNs may have prepared them for — they need bachelor-level training according to some. A BSN may also be the way to go if you want to work in a specialized area, such as oncology or physical rehabilitation. The same holds true if you aspire to work in any of the senior leadership positions that will be opening up as older nurses retire." -NursingLicensure.org, "The Future of the Associate Degree in Nursing Program"
Is there a high demand for bachelor prepared nurses? The Institute of Medicine recommends that “the proportion of nurses with baccalaureate degrees be increased to 80 percent by 2020”. Why are bachelor prepared nurses in high demand? "Demand for higher-skilled nurses is rising for a few reasons, first of which is America’s surging population of elderly adults. This population needs more and more complex care than other age brackets. Coupled with this is the looming retirement of a huge swath of the present-day nursing workforce—more than 900,000 of America’s 3 million currently-employed nurses are over 50 years old—which leaves many new nurses with more responsibilities and bigger workloads to fill in the gaps. Making matters worse, there is a looming shortage of doctors, too. The American Association of Medical Colleges projects a shortfall of 91,500 physicians nationwide by 2020. Medical systems have been feeling the strain already for the past few years and have compensated through 'task-shifting' — having nurses take over some physician duties such as writing prescriptions and diagnosing some of the simpler and more treatable cases." 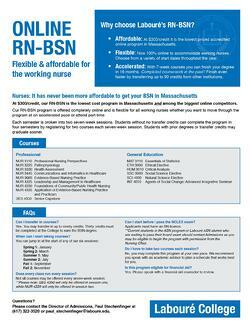 Do I need to have my RN license to enroll in the RN-BSN program? If you are not yet a registered nurse (RN), we invite you to look at our Associate in Science in Nursing program, which will prepare you for the board exam to receive your RN credential. Students who have completed a Nursing program elsewhere and are waiting to pass their board exam must do so before they are eligible for admission to Labouré's RN-BSN program. *Current Labouré College Associate in Science in Nursing students or Labouré College ASN alumni who are waiting to pass their board exam should contact the Office of Admissions as you may be eligible to begin the RN-BSN program with permission from the program chairperson. Do you have (or are you willing to obtain) Internet access at home? The purpose of the Labouré College RN-BSN Nursing Program is to move the associate degree nurses beyond basic nursing skills to advanced pathophysiology, critical thinking, leadership and management, and evidence-based practice research skills. The program prepares registered nurses for a generalist professional practice in a variety of setting and provides graduates with a foundation for graduate study and life-long learning. 1. Synthesize knowledge from a broad-based liberal arts and scieces core curriculum with nursing science to generate innovative and valid clinical decisions. 2. Recognize basic organization models and exhibit a potential for leadership and quality care within the present-day healthcare arena. 3. Cultivate values, beliefs and practices which embody a framework for implementation of evidence-based practice and scholarship. 4. Incorporate the use of communication and informatics to broaden the scope of clinical practice and critical thinking. 5. Participate in the sociopolitical process that affects nursing practice. 6. Examine concepts of individual and population health initiatives for the promotion of health and prevention of disease across the lifespan. 7. Engage in professionalism, leadership and management skills to promote collaboration and to cultivate a safe and caring environment. The RN-BSN program utilizes the 2008 Essentials of Baccalaureate Education for Professional Nursing Practice as the organizing framework for the program.